What I made today. This is a soon-to-be-released die cut from Sizzix. I am participating in a design collective with a whole bunch of other designers to see what we all come up with and this is my first project. I will post a set of links to all the other designers and you can vote for your favorite at www.eileenhull.blogspot.com, it will enter you to win the Sizzix die! Please note that my sender recycled the packaging from some specialty paper to protect the contents! Love that! So I have all these "blank canvases" to express my creativity and our first "assignment" was office supplies. OK I was having a touch of the old creative block as it were. and these pages, specifically the one that contains the sewing pattern paper, jumped out at me and said this is the direction to go! Click on these pages to read all about how to use paper resources in our every day lives, brilliant! I had a stash of sewing pattern paper that had been used as packing tissue (so technically I was reusing it a third time) and decoupaged it onto the box with Mod Podge. I left the tabs free of material so the tape would have a clean surface to stick to. Then, since our "assignment" was office supplies I used an over-sized paper clip as my handle and attached it to the top of the box with office binding brads. To make my closure I was back to the sewing supplies. I trimmed down an old measuring tape and made a buckle from two safety pins. 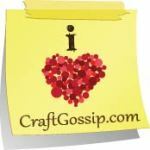 My "office" is the same as my "sewing room" so these supplies work "seamlessly" together! Ha! I kill myself with the puns sometimes....you can stop groaning now. Collage Lab offers artists and crafters a fun and experimental approach to making art. The book is organized into 52 different labs which may, but don't need to be explored on a weekly basis. The labs can be worked in any order, so that readers can flip around to learn a new mixed-media technique or be inspired by a particular collage theme or application. The underlying message of this book is that artists can and should learn and gain expertise through experimentation and play. There is no right or wrong result for a given exercise, yet, readers will gain skills and confidence in collage techniques, allowing them to take their work to a new level. Collage Lab is illustrated with brilliant full-color images and multiple examples of each exercise, offers a visual, non-linear approach to learning art techniques, and reinforces a fun and fearless approach to making art. Bee Shay is a print maker, collage and mixed media artist, and longtime instructor. She has contributed to magazines, including the Artistic Stenciler and Somerset Studio. Her work has also been featured in several Quarry Books including:True Vision ,Collaborative Art Journals and Shared Visions in Mixed Media, The Creative Entrepreneur, and Re-Bound. Bee lives with her husband in the Philadelphia area and is mother of three beautiful souls. When she's not inciting the muse in her students or working in her barn studio she lovingly calls her nest, she can be found roaming outside seeking the wonders of the natural world for inspiration. Very cool project - yours turned out great! I just got this book from Amazon and I love it! Wonderful ideas presented in a different and functional format. I love the pattern decoupage. The box is really cute, but at first glance I thought it was really tiny. Then I realized the paper clip was supersized! I'm so excited to a part of this "hop" and your creation is so inspiring! I especially love the "handle"! Brilliant! What a way to use a huge paper clip! And the closure out of measuring tape....simply brilliant! Cool project Bee - love it!!! I came within inches of using pattern tissue to cover my box also! Lovin' the giant paperclip handle! Very clever! Really like your pattern paper idea, and that huge paperclip is great! It's like you gave the earth a little hug! I love this, and especially that giant paper clip handle. Bravo! Thanks Stephanie- great project. Looks like your handle is a winning touch- that's what I was going to say too, but also love the use of old pattern to cover the box. My thrift shop uses that tissue to wrap glassware when they sell a piece.